We aim to be a welcoming, caring, loving and worshipping community, firmly rooted in the teachings of Christ, recognising and respecting each individual as a unique gift from God. Together, forging a partnership working for the good of all to enable us to grow and develop spiritually, academically, socially and morally. Religious Studies is a classical subject and students entering the following professions; Law, Journalism, Teaching and Media Communication will usually study this subject at A Level. Pupils at KS3 are engaged in active learning through discussion, role-play, team work, games and debate. This allows pupils to develop TSPC, as well as developing Literacy in which RE is a core contributing subject. At GCSE we follow CCEA. The ‘Full’ GCSE course comprises of two modules. Unit 8 ‘Christian Ethics’ is completed in June of Year 12. Each module is worth 50% .There is no controlled assessment or coursework. Alternative courses are offered in order to accommodate pupils of all abilities such as the Entry Level Qualification. Textual Studies - at AS ‘An Introduction to the Gospel of Luke’ and at A2 ‘Themes in the Synoptic Gospels’. Systematic Study of One Religion – at AS ‘The Origins and development of the Early Christian Church’ and at A2 ‘Themes in the Celtic Church, Reformation and Post Reformation. Religious Studies at A Level is a very popular subject amongst the students. Mrs S Doherty leads an impressive Junior and Senior – MAD (Making A Difference group, which deals with areas around social Justice and the environment. The group assists with the preparation and delivery of assemblies. 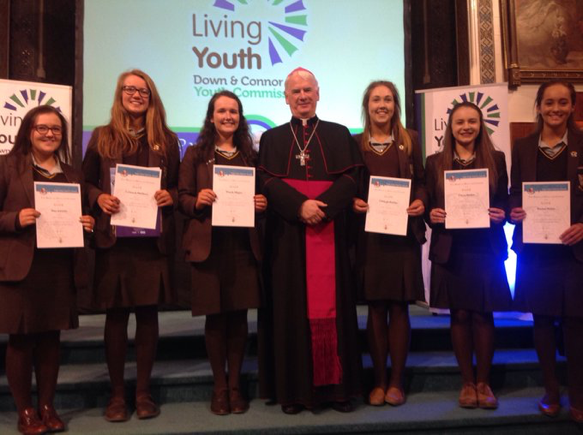 Mrs G Campbell leads a group of Sixth Year students in the popular John Paul II Award. This award scheme has seen extensive networking between the school, local businesses and charities. The pupils give up their own time to ‘volunteer’ their services. Students are also more actively engaged in the Church and liturgical services.